Konstantinos Karamanlis was born in the market town of Proti, near Serres, on 8 March 1907. His father, George, a primary school teacher and cultivator, had been persecuted and taken hostage for his nationalistic activity, by both the Turkish and, subsequently, the Bulgarian authorities of occupation. 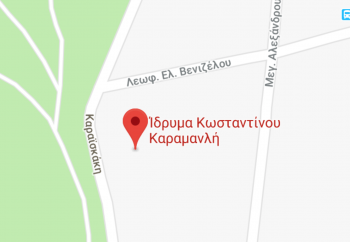 As a schoolboy he lived successively in Proti, Nea Zichni, Serres, and finally in Athens where, after finishing his secondary school studies, he enrolled at the Law School of the University of Athens, whence he obtained his degree in 1929. He worked as a lawyer in his native homeland until he was first elected member of Parliament in 1935. His early life memories and the experiences of his youth are connected to the harsh national struggles and fraught with political confrontations which resulted in arming Konstantinos Karamanlis with lessons learned that were to be a determining factor in the choices he made in the course of his lengthy political career: that a functioning state requires stability and continuity; the long-lasting era of internal anomaly had to be brought to an end; that transgression of the limits of democratic legality is inadmissible in the name of any criteria of expediency whatsoever; political figures should conduct themselves in a spirit of tolerance and being true to their word. The fresh tribulations endured by the country, marking its history in the years following Karamanlis’ entry into political life, further reinforced his firm trend toward pacifying political fury and the achievement of a creative lifework. The course Karamanlis followed at the government benches from 1946 to 1955 set the seal on his particular sensitivities and revealed the style of politics and ethos specific to his dogma. During his terms as Minister, of Labour initially – of short duration – Transportation and, subsequently until 1950, of Social Welfare, he demonstrated that he was resolutely determined, hard-working, capable of the conception and application of daring project planning, while, at the same time, placing the national interests first and foremost. These characteristics became more evident when he served as Public Works Minister in the Papagos administration. In the three years between 1952-1955, what he achieved was of crucial importance for Greece’s economic development and modernization: the construction of a network of central road arteries across the board of the territory; execution of substantial land reclamation works; establishment of efficient units of energy and power production; conservation and enhancement of historical monuments; creating an infrastructure for the development of tourism; ensuring the water supply, and the execution of improved road networks and projects of embellishment in the broader Athens and Thessaloniki areas. During that period, July of 1951, he married Amalia Kanellopoulou. His endeavours made the most favourable impression on public opinion and earned him popular preference for his accession to the office of prime minister upon the death of Alexandros Papagos. 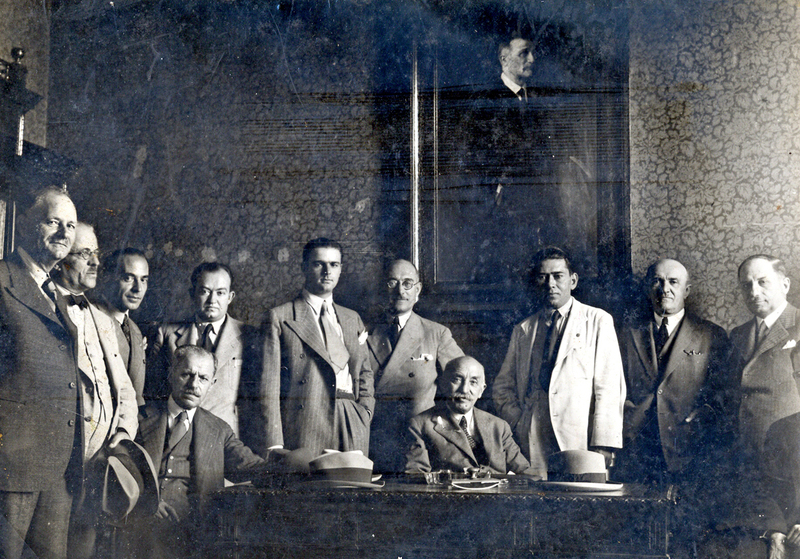 The initiative on the part of King Paul, on 5 October 1955, to ask Konstantinos Karamanlis to form a government, met with the positive response of the group of parliamentarians and the majority of the supporters of the Hellenikos Synagermos party. Nevertheless, wishing to introduce fresh life into politics, Karamanlis founded a new party, the Ethniki Rizospastiki Enosi (National Radical Union) and premature elections were held in February 1956. His victory in these elections, as well as two further electoral contests in 1958 and 1961, enabled him to remain in office for eight consecutive years, a time span without precedent in Greece’s political history. In the course of his first term as prime minister, Karamanlis’ primary concern and greatest achievement was the planning and application of a programme for reinforcing the country’s economic growth. The steady upward trend of the economy, resulting in doubling the GNP, at an average annual rate of 6.25%; the redistribution and increase of per capita income from $305 to $565, with a rate of inflation of just 2%; the rapid progress made in the investment sector; the reviving of the banking system and encouragement of financing; the improvement of Greece’s position in foreign exchange and the restoration of balance in the external accounts, combined with the promotion of exports; the reinforcement of the domestic product; the development of shipping and tourism and, finally, the influx of foreign capital investment, constitute the principal parameters of the positive outcome in the economic sphere. Karamanlis aimed at strengthening the production capacity of the country: the implementation of infra-structure large-scale electrification works; application of a programme of electricity supply; drawing up the first five-year plan and establishing the Organization for Industrial Development; land reclamation works; new kinds of cultivations; reafforestation; establishment of agro-industries and the improvement of commercial conditions in agriculture. The public works programme continued and was extended by completing construction of a modern highway network, culminating in the Patras – Athens – Thessaloniki -Evzonoi thoroughfare (PATHE); the water supply and embellishment of the major urban centres; the execution of public welfare works in the provinces; the rapid development of tourism. The upward trend of the economy enabled Karamanlis to turn his attention in due course to issues such as the reinforcement of education and culture as well as, for the first time, of sports and, furthermore, to the broader support of the social welfare sector and the enactment of institutional measures for social welfare, most notably the establishment in 1961 of the Agricultural Pensions Organization. Karamanlis’ vision of a country freed from the curse of conditions consequent upon recession and poverty, was in his mind interwoven with the need, at the international level, for a dynamic response to the challenges of the era. At a time of intense global tensions, it was natural to seek to meet the needs for consolidating national security and territorial integrity, initially by adherence to NATO. Opportunities for an ‘opening to the East’ with the objective of easing international pressures and providing fresh potential for collaboration came about during the last phase of his eight-year term in office, coinciding with détente. Karamanlis also successfully promoted good relations with the Third World, the Arab countries especially, whilst at all times, should the need arise, placing first the interests of Greece in the periphery. At the same time, he strove to resolve the Cyprus national issue, with the declaration of independence in 1960, after five years of armed conflict on the part of the Cypriot people and the hard – and disadvantaged – diplomatic endeavours of the Greek governments. However, the most crucial issue in Karamanlis’ mapping of foreign policy was the adherence to the European Common Market which was “not merely an economic joint-venture, but an entity with a broader political mission and significance”. 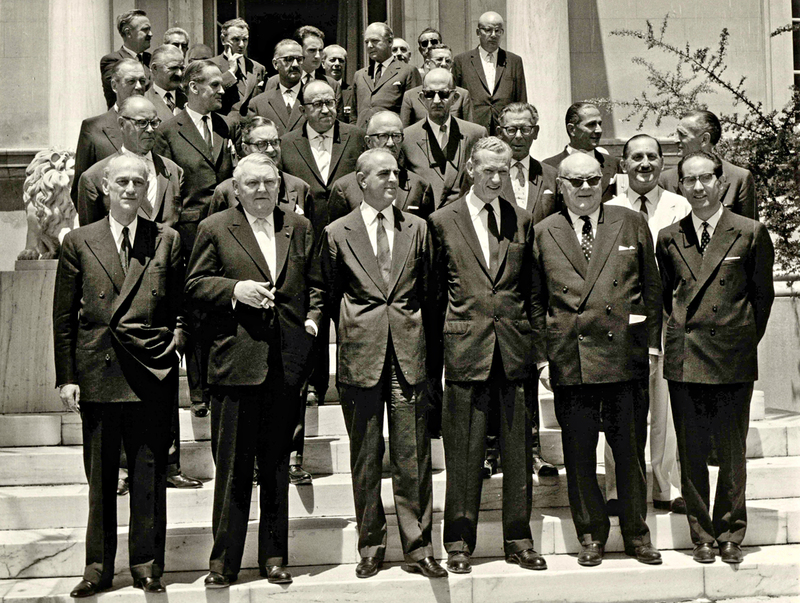 Following two years of intensive negotiations, Greece was admitted to join the initial group of six member states as its first associate member, on 9 July 1961. 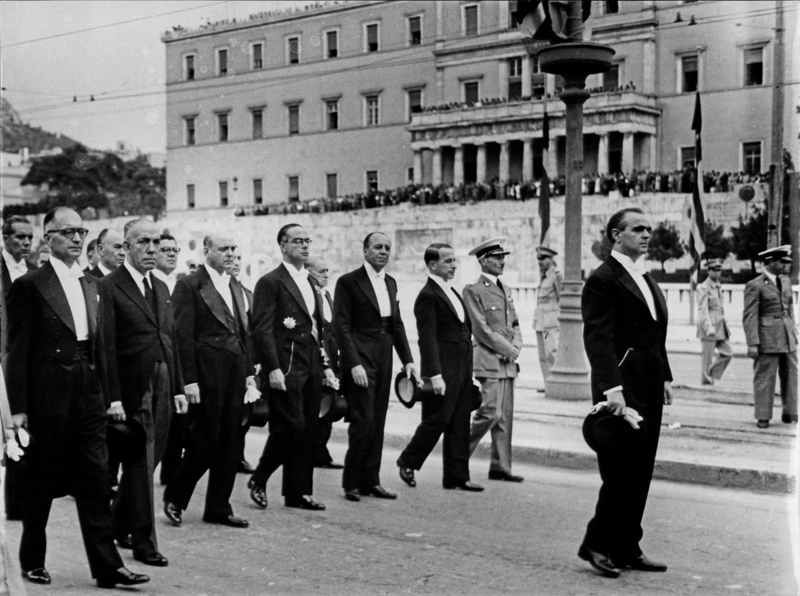 Karamanlis’ first period in office was unexpectedly cut short by his resignation, in June 1963, following a disagreement with King Paul which led to a profound breach in his relations with the Palace. The crisis was connected to the general climate of political tension reigning in the aftermath of copious complaints on the part of the Opposition denouncing Karamanlis’ alleged involvement in acts to which he was demonstratively a stranger, such as the conduct of the 1961elections under a caretaker government selected by the Palace, or, the assassination of Grigoris Lambrakis. In conclusion, the equivocal outcome of the new electoral contest in November, and the assignment of the formation of a minority government, allowing a broad field of initiative to the leader of the opposition, armed Karamanlis with the irrevocable conviction that the political conditions were unsuitable for the fulfilment of his goals. A month later, going abroad, he forewarned of the danger of a gradual degradation of the democratic system of government and the lapse toward anomalous solutions. From Paris, where he remained for eleven years, Karamanlis never ceased to follow closely, and in anguish, the events unfolding in Greece, and after the coup of 21 April 1967 undertook a series of initiatives for the overthrow of the dictatorship and the restoration of a functioning democratic government on a new basis. On opportune occasions he denounced the ”τyrannical and illicit” regime, pointed out the consequences ensuing from its prolongation, while he contributed at the same time, with actions of a responsible nature, to keeping international public opinion authoritatively informed and to boosting the morale of the Greek people. Ever the constant point of reference in any attempt made to revert to a democratic regime, at midnight of 23/24 July 1974, the military leadership and the representatives of the political world asked Konstantinos Karamanlis to take into his hands the reins of power. This was the date on which the ‘reckless’ coup engineered by the junta in Cyprus provoked the invasion of Turkish troops and threatened to involve Greece – which was in no state of readiness for war – in a military conflict of incalculably grave consequences. The circumstances of his arrival in Athens, to be greeted by a populace incandescent with joy at the restoration of liberty, are scenes that will forever be indelibly imprinted in historical memory. At the head of a government of National Union, avoiding any perilous turbulence, Karamanlis was able to restore a well-functioning democracy. In the first free elections of 17 November 1974, Karamanlis won a resounding 54% of votes. His victory in the next elections of November 1977 permitted his remaining in power for six years, at the head of the New Democracy party, a newly established formation based on the ideology of radical liberalism. The referendum conducted on 8 December 1974 finally put an end to the long-dated controversy surrounding the issue of the country’s polity, by definitively establishing a Republic. The elaboration and enactment of a new Constitution in June 1975 brought about the necessary conditions for establishing and consolidating firmly the fundamentals of democracy at all levels. The predominance thenceforth of a calm political climate, the enhancement of political ethics and parliamentary practices and, generally, the strengthening of democratic dialogue and of individual liberties are credited to Karamanlis’ achievements. In parallel with the consolidation of democracy, positive measures were undertaken in the sector of the economy and broader social sector, in spite of the effects, towards the end of Karamanlis’ six-year term, of the global energy crisis: revenue was redistributed; increased financing the economy resulted in satisfactory rates of growth of the Gross National Product; planning and execution of substantial public works; progressive measures in the sector of social policy; in the sphere of education, the use of two forms of language was abolished, reforms in elementary and middle schooling and upgrading of technical training; measures taken for the improvement in general of quality of life – protection of the cultural heritage, institutionalization of environmental protection, a number of effective measures in the sports sector. The path-breaking proposition to hold the Olympic Games on a permanent basis in Olympia reflects Karamanlis’ broader vision. Strengthening the national security and territorial integrity, through the doubling of military expenditures, coupled with a diplomatic offensive to enhance Greece’s international position, formed the basis of Karamanlis’ foreign policy. Despite his decision to sever military relations with NATO when the Organization proved unable to react to the expansion of the Turkish-occupied zone in Cyprus, relations on the political level were aintained, reserving the possibility of a return, which in fact became the case when continuing abstention was judged perilous for Greece. The policy of maintaining a balance of power between Greece and Turkey was successful, through the grants of American military aid in a proportion of seven to ten. On general lines, Karamanlis’ quest for a diplomatic strategy capable of covering all aspects regarding Greece’s interests, without deviating from his central orientation, added a new and forceful content to Greek foreign policy at both the peripheral and international levels. The “opening” to the countries of the Soviet bloc was connected with the promotion of fresh forms of intra-Balkan cooperation, on bilateral and multilateral levels, culminating in his visit to Moscow and Beijing in 1979, the first of a Greek prime minister. The traditional friendship of Greece with the Arab world was meanwhile reinforced and renewed, also in view of Greece’s position as a connecting link between communitarian Europe and the Middle East. 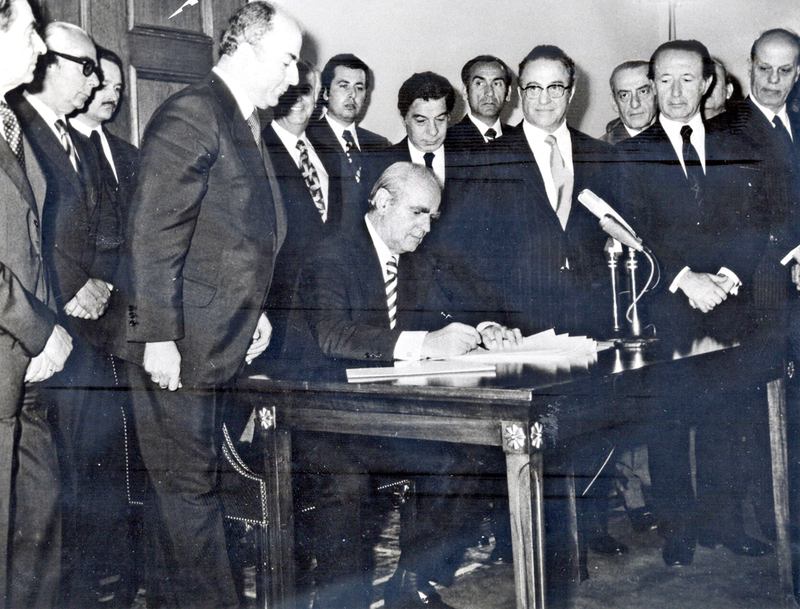 However, Karamanlis’ greatest achievement in the international field was to secure the incorporation of Greece in the European Common Market, after three years of intensive negotiations, in line with the policy Karamanlis himself had inaugurated 20 years earlier, of the timely connection of Greece to the European Community. 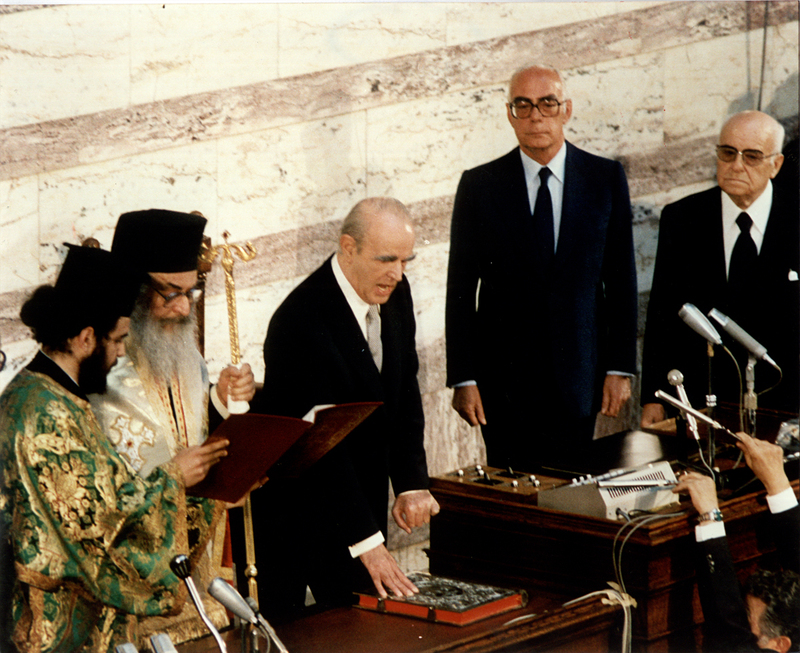 On May 5th 1980, Karamanlis was elected President of the Republic. An undeviating dedication to strict adherence to constitutional rules and to the conscientious maintenance of an objective stance over and above political conflicts; ensuring the regular succession of parties acceding to power; contributing to the soothing of political fanaticism as well as the consolidation of the spirit of national unity were the elements constituting the principal parameters of Karamanlis’ presence. Konstantinos Karamanlis passed away on 23 April 1998, 3 years after his exiting from active political life. For 60 years he had been present on the political stage, 8 years as minister, fourteen as prime minister and ten as President of the Hellenic Republic. His passage through public life was marked by growing economic prosperity for Greece, the consolidation of democracy and the country’s incorporation into the European Union, the major aspirations of Karamanlis’ political career.